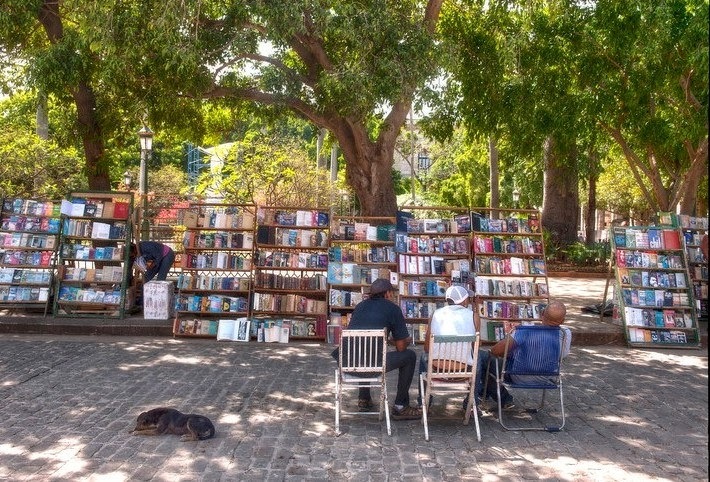 During a recent visit to Havana, I hailed a taxi (a 1958 Ford) and rumbled over to the Plaza de Armas to look for some old menus. 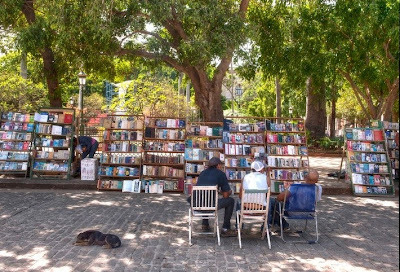 Every day dozens of private booksellers set up their stalls in this leafy square, selling used books, random pieces of ephemera, and souvenir photographs taken in famous nightclubs like the Tropicana during its heyday. There are also some unusual books dating back to the nineteenth century. One such rarity that caught my eye was a finely-bound volume containing copies of Frank’s Illustrated Weekly for the month of July 1870. As tempting as it was, I decided not to purchase this treasure, preferring to stay focused on my mission to find historical evidence of Cuban influence on the foodways of the United States, or conversely, the spread of American culture abroad. 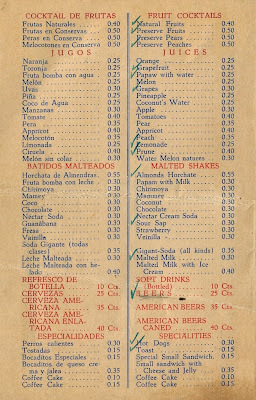 And as luck would have it, I soon discovered a menu from the Cafeteria America. Coming from the period just before the revolution in 1959, it illustrated the simple pleasures of everyday life once enjoyed by the middle- and upper-classes in Cuba. 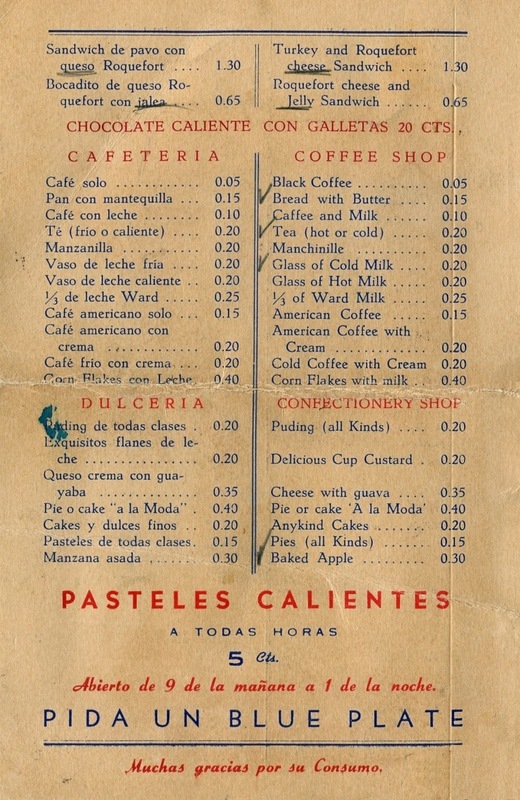 The Cafeteria America was a coffee shop (called a “cafeteria” in Spanish) and bakery that operated in the America Building. Located on the corner of Galiano and Neptune streets in the Vedado section of Havana, this eleven-story edifice opened in 1941, featuring the symmetrical lines and elegant forms of Art Deco design. The complex contained sixty-four residential apartments, several businesses on the ground floor, and an 1800-seat theater described as a small version of Radio City Music Hall. 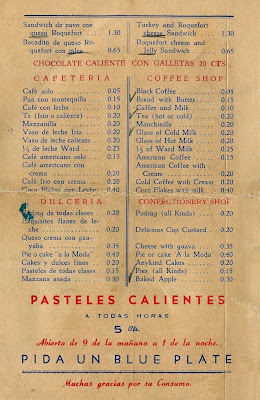 The menu below appears in Spanish and English. 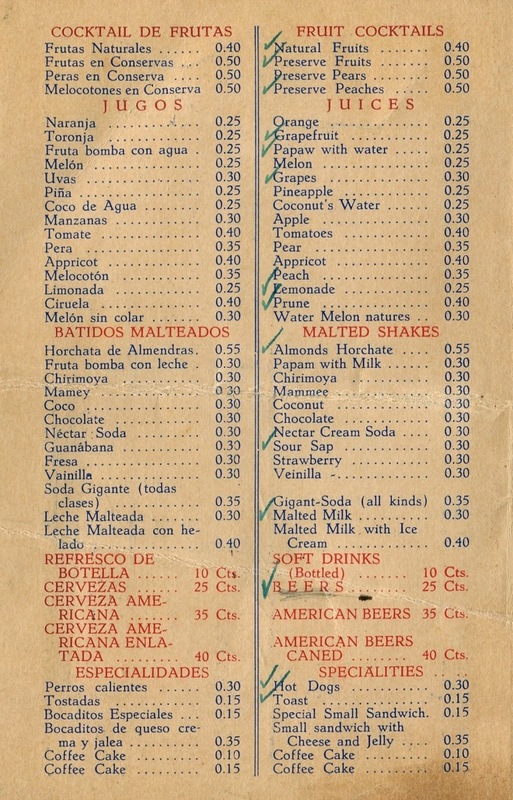 In addition to typical American dishes, the bill of fare includes a few local specialties, such as malted shakes made with tropical fruits like mamey and cherimoya. 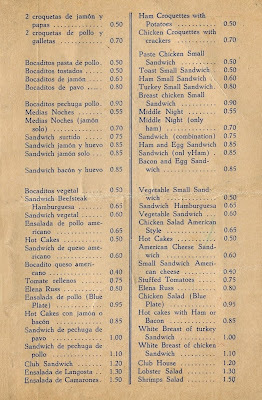 There are also two kinds of croquettes and a turkey sandwich called an “Elena Russ.” Commonly spelled “Ruz” or “Ruiz” today, this iconic Cuban sandwich was supposedly christened after a society debutante who whimsically ordered one in the 1930s at El Carmelo, a restaurant where she and her friends went after a dance. It is made by smearing a generous portion of cream cheese on a piece of white toast, strawberry preserves on the other, and assembling it with slices of turkey in the middle. 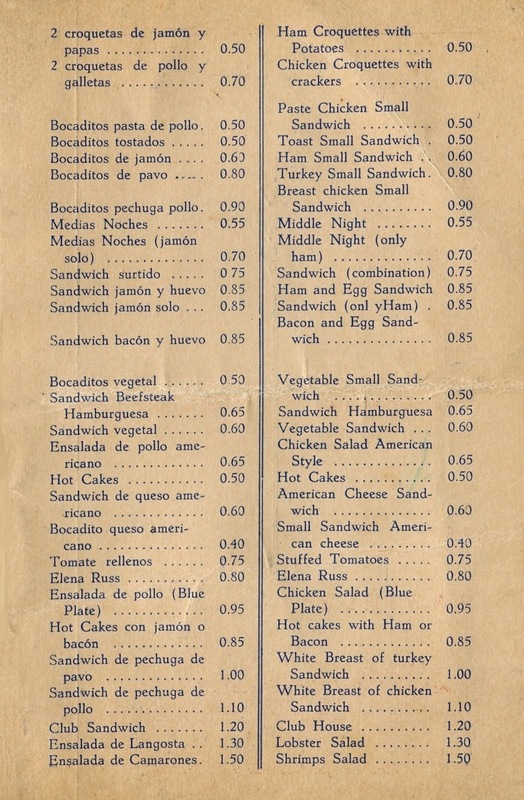 The Cafeteria America was also a late-night haunt, as evidenced by a ham sandwich called a Medias Noches (Middle of the Night), suggesting that it was considered an after-theater snack. 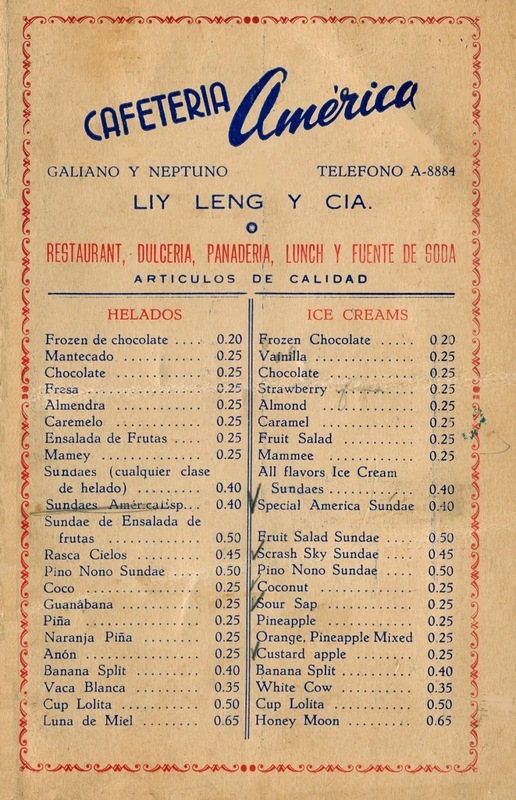 The proprietor was Liy Leng, a Chinese-Cuban whose name is prominently shown on the first page. Such a wise post. 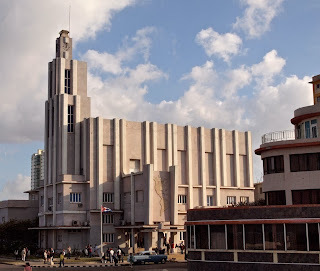 I love the Cuban deco architecture and the old cars that go on and on. It must have been a great trip. That is one amazing menu. I wonder if the food was good? Graceful post, with a melancholy edge suitable to the material. The Elena Russ is a new one for me. At first the strawberry jam struck a discordant note, but when you think of it, not really: surely it's a counterpart to cranberry in its role as soul mate to turkey. The sandwich in part resembles the Louisville Hot Brown, of which there was a cold version, whose origins connect also the social set looking for an early morning fillip. 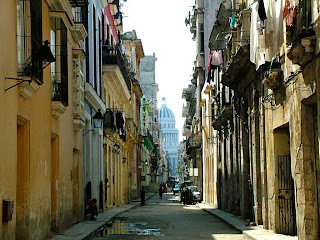 I would think something connects the two dishes, probably the deb circuit then included Cuba and perhaps Ms. Elena Russ picked up the idea through U.S. friends. Great post. I like the Sandwich Hamburguesa and Anykind Cakes. Really interesting post. By the way, the "Y Cia" is "& Company." 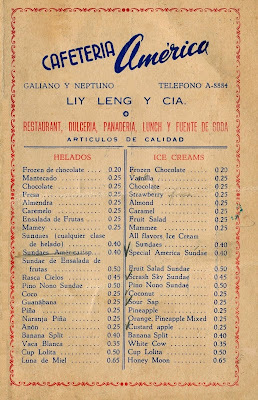 Curious about Sr. Leng, and what sort of Chinese-Cuban community exists today. I love the writing.... Especially the part about simple pleasures (now gone). Piex (all kinds): there's capitalism for ya.